There Must Be a Better Way to Build? As winter settles in bringing chilly mornings and nights to Dunedin I'm again confronted with just how cold our NZ homes are. With a new baby in our house this autumn this is more prominent in my mind than other years and I'm wondering how long the pile of fire wood will last if it continues diminishing at the current rate! Not to mention the condensation on the bedroom windows and the increasing power bill as we run the heat pump and dehumidifier. Over the 10 Years I’ve had in the NZ building industry and reflecting on the year I spent building overseas, I’ve seen how poor the quality of our NZ homes are and how far behind we are compared to many other places in the world. It makes me question the low performance of most of the current new build houses in New Zealand. Too many of our homes are built to the minimum requirements of the NZ building code. In other words, these buildings are built to the lowest standards you are legally allowed to build. Unfortunately, at the moment the standard of the NZ building code is disappointingly low considering our climate and it would be my hope this would change in the coming years. New code minimum houses built have insulation and double-glazed windows and might be a bit warmer than our 100+ year old villa but these houses can still be damp, expensive to heat and uncomfortable to live in. In my opinion that’s not good enough, there must be a better way to build - and I think I have found out what this way is. Earlier this year I spent an intensive week of theory and practical learning at Auckland’s Certified Passive House Tradesperson course. 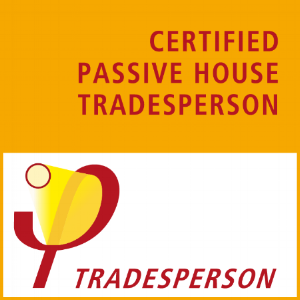 After sitting a notoriously tough 90min exam at the end of the week the results from Germany are in and I’m proud to be Dunedin’s first certified passive house tradesperson! What is Passive House? And why do I suggest it’s applied principles are a better way of building? Passive House, or Passivhaus in German, is a building standard that is truly efficient, comfortable and affordable at the same time. It is not a brand name but a tried and true construction concept that can be applied by anyone, anywhere. Passive house is a performance standard. It is not a design standard or an architectural style, but a design process that is integrated within the architectural design. There are no restrictions on design or construction methodology. Nelson to Dunedin. For example, a certified passive house in Dunedin will require triple glazed windows and more insulation than a certified passive house in Nelson, where it is likely to only require double glazed windows and will need less insulation to meet the performance criteria due to the warmer climate. It is also not limited to only houses, there are several, schools, offices and even a fire station built to this standard worldwide. We will have more to come on these key principles later but in the meantime, here is a short video explaining the basics of these. If you are interested in this concept and would like to investigate the possibility of building a home using these principles please feel free to contact me. I would also love to hear your feedback.